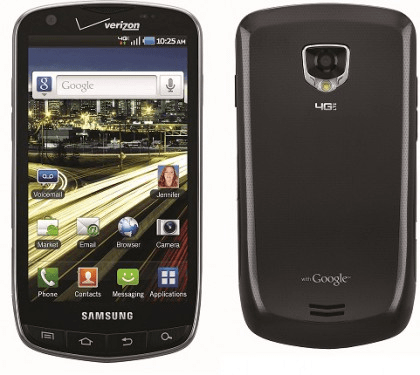 This hot 4G cellphone was announced in at CES 2011 by Samsung & After going through some hiccups its finally available with Verizon from 28th of April & her is small overview of the Droid Charge From Samsung. Similar as it was announced Samsung Droid Charge gives you a big 4.3-inch touchscreen of resolution 800×480, which is quite impressive in this category high end android smart phones. Droid is little over 5 inches in height & 2.6 inches wide. Its thickness of less than half inch makes it perfect to fit in palm as well as pocket and makes it weighing just 5.04 ounces. Verizon Droid Charge comes with a powerful 1GHz processor & 512MB of RAM for high speed processing & muti tasking. This cool phone is not just a 4G capable device but also comes with great multimedia features like 8MP camera with flash, 1.3MP front-facing camera, HDMI out & much more usual features. Droid Charge comes with 2GB of internal storage & expandable up to 32 GB for storing your favorite movies, pictures & documents. The phone is tapering from top to bottom & its four physical buttons are very well embedded in to it. The phone is made up of high grade plastic which feels good in hand & the large buttons makes it unique design compared to any other android smartphone. Samsung have came up with nothing newer in its Touchwiz interface, but android makes it pretty customizable. In This Droid Charge Quick Review We Would describe as – Bigger Android with 4G Capabilities. Hope this quick review will be helpful for you, I will try to make detailed review and comparison of Droid Charge with some other great phones too. Please let us know your suggestions here in comments.